Dance Towards Health, Inc. is a newly formed Non-profit Health Education organization. Our mission is to educate children, teens and adults about the health benefits of recreational dance and choosing healthier food options in a non-competitive atmosphere. Dancing is healthy, and our number one goal is to have our participants up and moving and enjoying life! 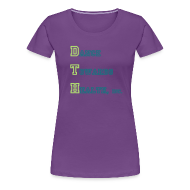 ﻿Learn more about the Obesity Epidemic﻿ here..
Support our Movement…Order DTH Apparel!